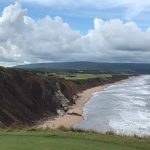 September 2018 I was lucky enough to take a trip to Cabot in Inverness Nova Scotia with a group of members from Oakfield Golf & Country Club. I was embarrassed to say it was my first trip to either course. Working around golf courses I had heard the stories and watched people’s eyes light up when they recounted their experiences. I didn’t think I was a fan of links style courses where you are blown over from the forces blowing off the Atlantic Ocean. People told me how cold it was, but that never seemed to bother them. How could that be? 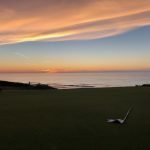 Playing in windy conditions is annoying, grinding it out on every shot is very tiring and I have never been a fan of cold temperatures,drizzle and whatever else mother nature could throw at you. From the moment you pull up to the property you know you are going to experience something very special. The wood, stone and glass on the buildings seem to have always been part of the landscape and just blends seamlessly into the links. 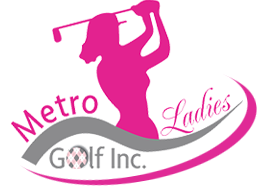 The staff on and off the course were very welcoming and friendly and did everything to make your stay first class. 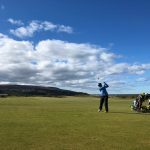 When I arrived, I stood at the back of 18 green watching a group finishing up with their caddies and a bright blue sky in the background and it looked like something out of a Hollywood movie. At that moment I knew this trip would be special. 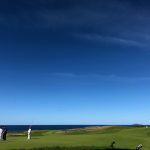 After being offered a homemade cookie before your first tee shot on the Links that afternoon I was mesmerized by the views. The ocean has a way of calming you and making your golf swing seem effortless. At the very least it reminds you there are more important things in life than your golf score. Breathe it in! Every hole was picture perfect with a view to the ocean. And the weather…I couldn’t tell you what it was like. All I knew was the course demanded my full attention. After the round we shared storied over dinner, drinks and live music at the Public House. 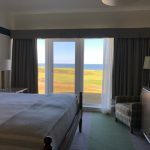 Accommodations were first class with an amazing view of the ocean. Day 2 we teed it up at The Cliffs. I didn’t think Cabot could get any better and then you play the Cliffs! The views were spectacular, and every hole offered up risk and reward. I never wanted the round to end. We sat on the signature white couches high above the cliffs on the back of the 18th green to watch our playing partners finish up. Nobody wanted the day to end. Driving home I was planning my second visit to this golfer’s paradise. 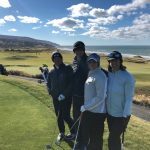 In late October, three girlfriends and I returned for the day to play the Links. The flags were sideways, temperatures dipped to -3 with the windchill but we smiled and laughed. It was a great day! If this course isn’t on your bucket list it needs to be. Grab some good friends pack all your outerwear and do it! You may just find what you are looking for – a gem in our own backyard. I am looking forward to returning in 2019 but might just plan a summer trip!